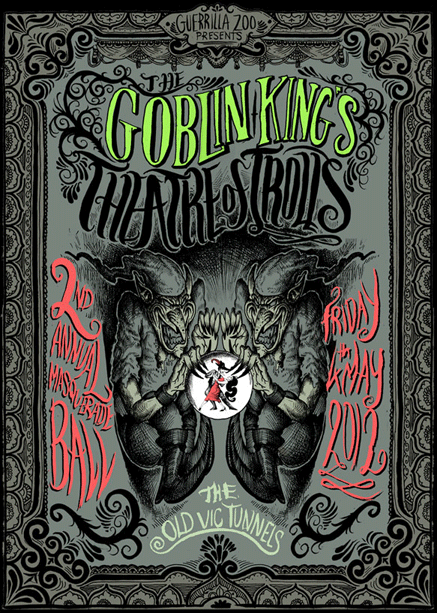 Lords and Ladies of Misrule, you are hereby invited by The Goblin King to his Annual Masquerade Ball. This evening see's the World Turn'd Upside Down; Where Fools become Princes for one night. Where Goblins, Nymphs, Ogres, Bad Faeries and other Creatures of the Night, beyond the realm of human vision, are free to make merry, tempt, seduce, carry out acts of foolishness and wantonness. Dearest revellers cast aside your thoughts of the next day and abandon yourselves to the mystical excesses and delirious cacophonies of The Goblin King's Theatre of Trolls. ALL TO BE ANNOUNCED SOON! 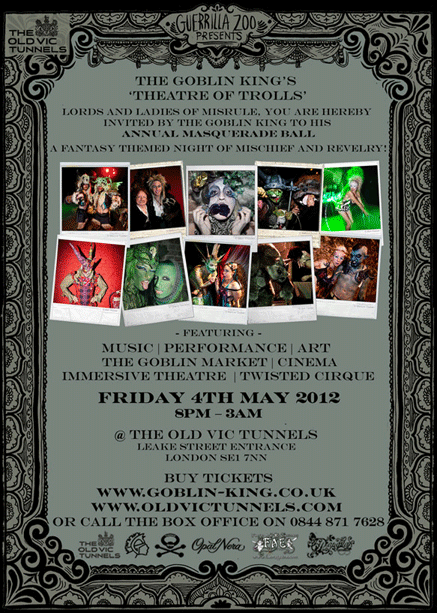 Please Note A £1 restoration levy for The Old Vic Tunnels will be included in the ticket fee. Costumes or formal attire with mask required. Imaginative and elaborate costumes recommended! Goblins, Bad Faeries, Terrible Trolls, Mischievous Nymphs, Unpleasant Pixies, Neo Victorian, Venetian Masks, Ball gowns, Boggarts, Brownies, Dryads, Dark Elves, Fawns, Satyrs, Wicked Giants, Jinn, Ogres, Queen Mab, Sprites, Horrid Harlequins, Misbehaving Imps, Bogeys, Gelflings, Hags , Sylphs, Sinister Skeksis, Green Man, May Queen, Spirits of Chaos and Disorder, Pan, etc! For inspiration check out the gallery. For costume hire visit Prangsta Costumiers and recieve a 20% discount.